The National Health Insurance (NHI) Office has begun the reimbursement of benefit claims as a function of the system. 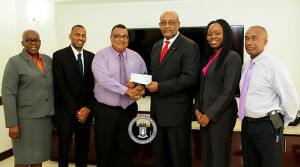 Minister for Health and Social Development, Honourable Ronnie W. Skelton presented a cheque to Mr. Richard Lake, the first individual to be compensated via the NHI system on February 1. Mr. Lake who is registered with NHI visited the ophthalmologist before receiving his NHI card and opted to pay out of pocket and filed his claim instead. All persons are reminded that all forms that include the registration forms and contributions forms for employers can be collected from the NHI Office at the Social Security Board (SSB) Joshua L. Smith Building in Road Town, Tortola; the SSB office in Virgin Gorda at the Vanterpool Administration Building; or online at www.vinhi.vg.